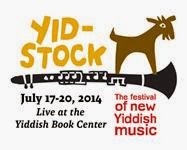 Now in its third year, Yidstock 2014 will once again bring a stellar lineup of klezmer legends and international stars to the stage at the Yiddish Book Center with concerts and music-related talks, workshops, and more. Yidstock 2014 offers a rare opportunity for festival goers to take in performances by several generations of the most accomplished and influential klezmer musicians, including those who revived the music in the 1980s, those who made it blossom in the klezmer renaissance of the 1990s, and those who are blazing new trails well into the 21st century. On the bill are The Klezmatics and the Klezmer Conservatory Band, widely considered to be the two greatest modern klezmer bands in the U.S. Other headliners include Berlin’s Daniel Kahn & the Painted Bird, one of the most creative and cutting-edge Yiddish ensembles; Basya Schechter: Songs of Wonder featuring poetry by the great Yiddish poet and theologian, Abraham Joshua Heschel, put to new music by Basya Schechter, founder and leader of the Jewish world-beat group Pharaoh’s Daughter; and the Nigunim Trio, featuring Lorin Sklamberg and Frank London (both of the Klezmatics) and pianist Rob Schwimmer, performing original and traditional nigunim and zmiros. The curtain will come down on Yidstock 2014 when Frank London’s Klezmer Brass Allstars, featuring acclaimed Yiddish vocalist Eleanor Reissa, take to the stage for the closing concert Sunday evening. A series of workshops is also on the schedule, including those in dance, instrumental klezmer, Yiddish song, and a multimedia journey through the history of klezmer music. Yidstock draws festival goers from around the country. Concerts usually sell out in advance. For more information, the complete schedule, and to purchase tickets visit www.yiddishbookcenter.org or call 413.256.4900. All events take place rain or shine.